If you don't remember today's specimen, you'd be forgiven: the Acer Iconia W510 is one of many, many tablet / laptop hybrids that have debuted over the past few months. Plus, this isn't even the highest-end Windows 8 PC Acer has to offer: unlike the W700, which has a 1080p screen and Ultrabook guts, the W510 runs off a Clover Trail-based Atom processor, and has a smaller 10.1-inch (1,366 x 768) display. Accordingly, the price is also lower: the W510 starts at $550 for the tablet only, though if you want to purchase it with the keyboard dock that price climbs to $750. (And if the dock really does double the battery life to 18 hours, you might want to.) All told, this is one of the least expensive systems we know of running full Windows 8. But is it any good? Let's find out. Note: We originally published a preview of the Iconia W510 on October 9th, 2012, at which time we only had a pre-production unit that wasn't ready to be benchmarked. In the absence of any hard performance scores, we chose not to include a review card or pass final judgment. Finally, on January 29th, 2013 we updated our story after testing a final unit. Our story now includes benchmark scores, a review card, a verdict and comparisons to other systems, some of which we had not tested when we published our original preview. Be the first to review the ICONIA W510? It was a little over a year ago that Acer CEO J.T. Wang vowed the company would stop making "cheap and unprofitable products" and focus on more premium items -- namely, Ultrabooks. And yet, the W510 feels like precisely the sort of low-end netbook that earned Acer its reputation for slipshod quality in the first place. Mostly, it's the keyboard dock that's the problem: the plastic buttons have a slightly scratchy feel, and look mismatched against the smooth, faux-metal keyboard deck. The hinge, meanwhile, is made of white, textured plastic, which seems out of place next to the rest of the system. 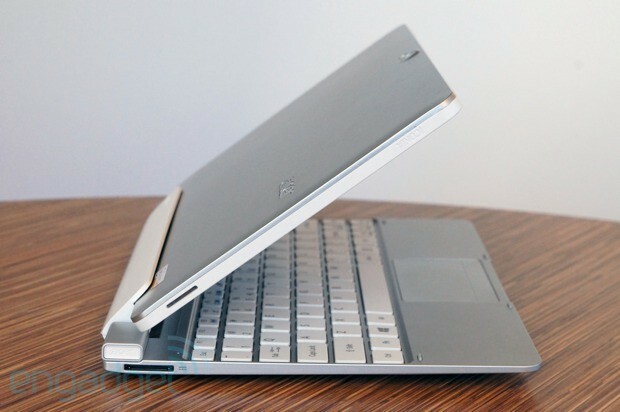 What's more, there's a large, unsightly gap between the hinge and the keyboard -- again, netbook redux. Not to go there, but we suspect it's because of products like this that Microsoft's management felt compelled to build the Surface. Even if you left the Surface out of this, you can still do better than the W510. 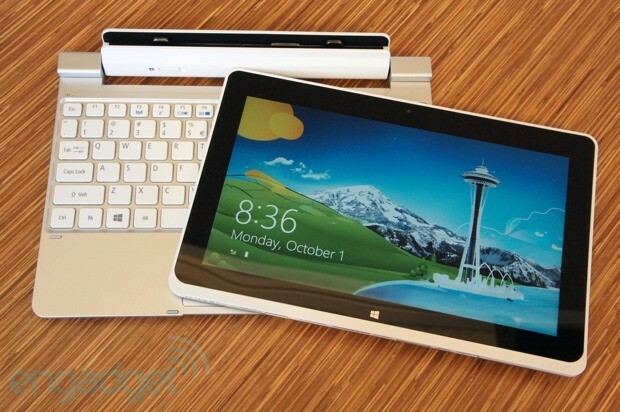 Just ask Samsung, or HP: if nothing else, their Windows 8 hybrids are at least more pleasant to look at. The W510 feels like precisely the sort of netbook that earned Acer its reputation for slipshod quality in the first place. Visceral reactions aside, we have some concerns about the build quality. We found that the screen tends to wobble in its hinge -- a potential inconvenience for folks who work on jostling buses, planes and Amtrak cars. Also, the weight balance is such that the machine can easily fall backward if it's placed in the keyboard dock, and you've got the whole thing resting in your lap. There's a solution here -- i.e., keeping the display fixed at an upright angle -- but it's not a very good one. Still, having manhandled our tester machine a bit, we'd say it's safe to pick up the tablet by the screen with the keyboard attached; you don't have to worry about it falling out. On the plus side, too, the hinge feels sturdy. You can safely push the screen all the way back so that the keyboard is tucked behind the screen, with the keys face-down against your desk -- not that there's much advantage to using the tablet that way instead of in regular clamshell mode. The tablet itself has the same gray plastic shell, with a white band ringing the edges. On its own, without the keyboard dock nearby, it's actually not a bad piece of kit: plain, yes, but unassuming. In fact, we like the two-tone effect of the white band against the black bezel. The only thing we could have done without is the "Acer" and "Iconia" branding, etched into the plastic on different sides of the devices. Other than that, the tablet feels unexpectedly light, at 1.27 pounds, and for that we have those plastics to thank. (Even with the keyboard, by the way, it weighs just 2.63 pounds) In practice, the 10.1-inch screen is just wide enough that you might have trouble typing in landscape orientation if your hands aren't that big, but using the onscreen keyboard in portrait mode is easy; even when you're holding the tablet upright, the weight feels balanced enough that you don't have to strain to prop it up. Taking a tour around the device, you'll find the tablet portion is home to all the ports you'd expect to find on a mobile device. Up top, there's a headphone jack, power button and a switch for locking the screen orientation. 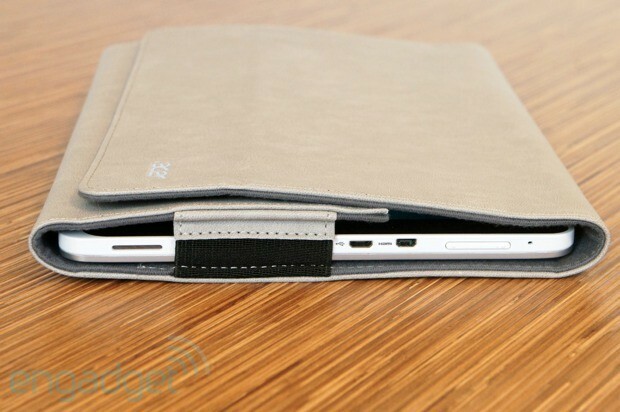 On the bottom side are the various connectors that allow the tablet to slip into the keyboard dock, and the right landscape edge houses a volume rocker, microSD slot, micro-USB port and micro-HDMI output. The W510 has dual speakers, one on each side of the tablet when you're holding it in landscape mode. Unfortunately, though, they're located precisely where you're likely to grip the device, so it's easy to muffle the sound if you're watching a movie while holding the tablet in-hand. Finally, there's an 8-megapixel camera and LED flash around back, along with a 2-megapixel shooter up front. The keyboard dock, meanwhile, is home to a full-size USB 2.0 port, along with a built-in 9-hour battery that promises to double the tablet's runtime. What you won't get is an SD card reader -- something ASUS typically offers on its Transformer Pad docks. There's also a charging slot, allowing you to use the same AC adapter you would with the tablet. That power connector is oddly large, but since there are no USB ports nearby, it's not like we have to worry about it obstructing any openings. 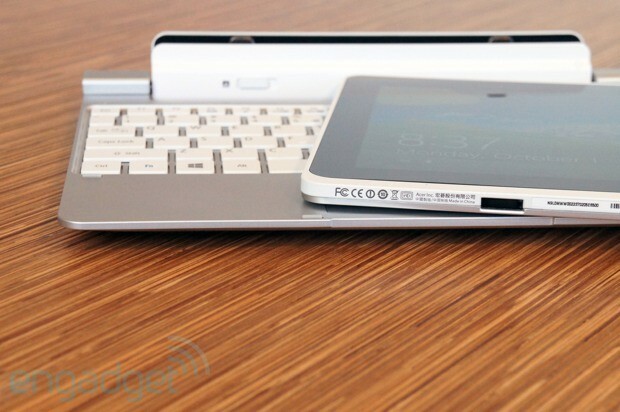 Additionally, Acer is offering some optional accessories alongside the W510. These include a micro-HDMI-to-VGA adapter, along with a pigeon-gray, faux-suede case. The sleeve has a super soft lining on the inside, and we appreciate how discreet the branding is; just a small metal logo that fades in with the suede, and nothing more. Though we're not impressed by the W510's build quality, its Gorilla Glass display is actually quite nice. Yes, 1,366 x 768 resolution is middle-of-the-road as far as PCs go, but it's standard for Atom-powered hybrids like this. And in terms of quality, the IPS panel offers some decently wide viewing angles. Working with the dock on a flat surface, you should have some leeway as far as dipping the screen forward or backward (a boon for people who get work done on airplanes). You can even get by watching a movie from a side angle, but we're also aware that people aren't terribly likely to crowd around a machine this small anyway. We'd add, too, that the viewing angles improved as we increased the brightness. At 350 nits, it's quite bright, yet the battery life is robust enough that we never worried that cranking the brightness would have an adverse effect on runtime. As on other tablets, the W510 doesn't deliver remarkably loud sound, and the audio quality is rather tinny with certain songs. Depending on your musical leanings, though, it's actually pleasant to listen to at the mid-range. Eric Clapton's "Layla" on acoustic guitar is enjoyable, for instance; synthesized songs like MGMT's "Kids," not so much. By now it's obvious we need to grade these Windows 8 keyboard docks on a curve: it's clear that creating a comfortable typing experience for a machine this small is no simple feat. In fact, we already knew that to be true: early netbooks offered terribly dense keyboards, and while PC makers like Toshiba eventually designed 10-inch laptops with more spacious layouts, we didn't really see progress until OEMs started putting out slightly larger 11-inch machines. It doesn't help, then, that the W510 has a 10- not 11-inch screen: that extra bit of real estate seems to be the difference between a cramped setup and something more usable. As you've probably gathered by now, the W510 falls into that first category: in order to fit everything inside that 10.2-inch-wide keyboard deck, Acer had to shrink certain buttons like the Tab key and the four arrows. To Acer's credit, though, it at least used all the available space: the keys extend nearly to the edge of the chassis on either side. While typing, we also found that our fingers easily found the letter keys. If anything, we ran into more problems when our thumbs kept reaching past the space bar and hit the trackpad instead. Speaking of the trackpad, it doesn't support gestures. That includes Windows 8-specific maneuvers, like swiping right to bring up the Charm Bar, but also two-finger scrolling and pinch-to-zoom. Basic stuff, don'tcha think? The W510's 8-megapixel rear shooter performs capably in daylight and with macro shots, though we routinely had to hold the tablet still for a couple seconds after tapping the shutter in the Windows 8 camera app. The shutter, by the way, isn't an onscreen button; you can tap anywhere onscreen to capture. Though there's no tap-to-focus feature, we found that, with still photos at least, the camera homed in on exactly the parts of photos we would have expected it to. With 1080p video, though, our clips sometimes slipped in and out of focus, as if the lens wasn't sure what the highlight of the shot was. Across the board, colors appear fairly muted, but you should notice a good deal of detail in your full-res, 8MP shots. Lower-lit shots will look a bit duller, of course, but even then, the noise level was tolerable. When it comes to things tablets are supposed to be good at, the W510 shines. For the most part, when we compare the W510 to netbooks, we're making a dig at its cheap build quality. But there's something else the two have in common: internals. Like netbooks of yore, the W510 packs an Intel Atom processor -- a 1.8GHz dual-core Z2760 CPU from the Clover Trail series, to be exact. Also like a netbook, it comes with 2GB of RAM. For storage, you'll get a 32GB SSD if you choose the lowest-end $500 model; every other configuration has 64GB of on-board storage. Either way, an SSD isn't something we would have taken for granted back in the netbook era; most minis at the time had spinning hard drives. As you'd expect, the Atom's performance has improved since it debuted in 2008, with the latest-gen Clover Trail chips promising 10 hours of use and three weeks on standby. We'd wager, too, that consumer expectations might have changed: when PC makers were stuffing Atom processors inside netbooks -- essentially, miniature laptops -- they had a heck of a time explaining to consumers what they could and couldn't do with these machines. In the case of tablets, though, we suspect no one is expecting laptop-grade performance. And when it comes to things tablets are supposed to be good at -- email, web browsing and video streaming -- the W510 shines. That Z2760 chip is also more than sufficient for handling the overhead of Windows 8. Not only was the touchscreen responsive, but we also didn't notice any lag when we launched programs, swiped right to expose the Charms Bar or swiped in from the left to rotate through open apps. 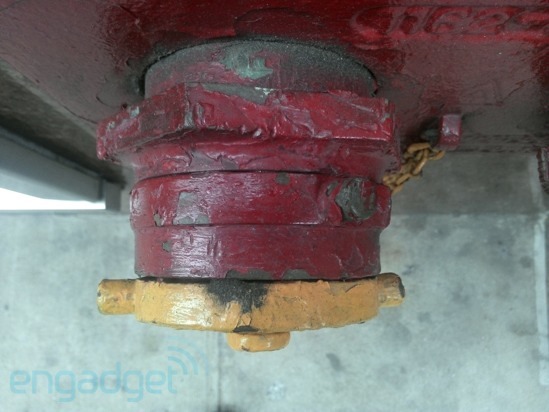 All of which is to say, the W510's performance is totally normal for an Atom-powered tablet. In fact, its synthetic benchmark scores closely match what we got from the HP Envy x2, which has the same processor and 2GB of RAM. In the disk benchmark ATTO, for instance, the W510 notched peak read speeds of 81 MB/s and max writes of 28 MB/s. That's only slightly lower than the x2's scores, which came to read speeds of 83 MB/s and writes of 34 MB/s. Booting into the start screen takes 13 seconds, compared with 15 for the x2. The only area where the two diverged in a significant way was in the general performance benchmark PCMark 7: the W510 scored 1,297, whereas the x2 got up to 1,425. Again, battery life is rated at up to nine hours on the tablet, and the keyboard dock promises to double that. We'd say that's about right: our test unit lasted through eight hours and 19 minutes of video playback, with a movie looping off the local drive, WiFi on and display brightness fixed at 50 percent. Admittedly, that's a pretty grueling test, so we're not at all surprised that we didn't get all the way to the nine-hour mark. With the keyboard dock attached, the W510 managed 14 hours and 17 minutes -- almost two hours longer than you'd get with the HP Envy x2 and its accompanying dock. 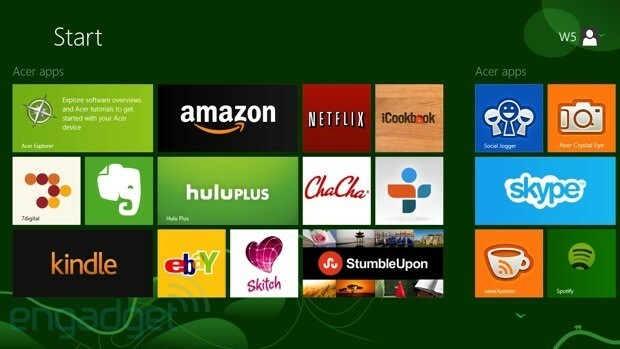 As we've seen on other Acer systems, the W510 comes with a good deal of pre-installed software, including Amazon.com's Windows 8 app, the Kindle reader, Netflix, Skype, Spotify, iCookBook, ChaCha, StumbleUpon, Skitch, eBay, Evernote, Hulu Plus, newsXpresso, the radio service TuneIn and the music / e-book seller 7digital. Additionally, Acer included its own Social Jogger hub, as well as Acer Explorer, which helps you, uh, get to know all those-pre-installed apps. Additionally, similar to other Acer PCs, the W510 is tied into Acer's free AcerCloud service, which allows you to remotely access stored items through an iOS or Android app. As a of a software update that went live in January 2013 (after the first draft of this review was published), you can now back up things on your mobile devices too. Like most other consumer electronics, particularly those in this price range, the W510 is covered by a one-year warranty. The nice thing about shopping around for Windows 8 hybrids is that all of the Atom-powered models, at least, have the same key specs: a 1.8GHz Atom processor, 2GB of RAM and 64GB of built-in storage. With that squared away, then, you're free to choose based on differences in the actual user experience -- you know, things like battery life or how comfortable the keyboard is. 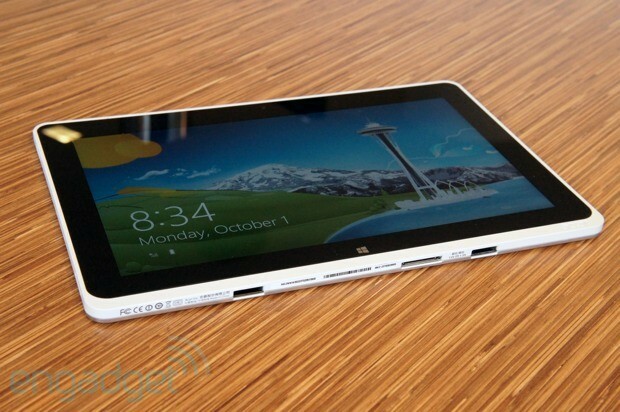 We already mentioned the HP Envy x2 as an obvious competitor. With an 11.6-inch display, it's slightly bigger, but just enough that the keyboard is noticeably more spacious. Don't get too excited, though: the keys themselves feel a little mushy. The battery life is also shorter, both on the tablet itself and with the accompanying keyboard dock. All told, the main reasons to get the x2 over the W510 are that it's more attractively designed, with pen support, NFC, slightly faster performance and, of course, that larger keyboard. Good reasons indeed -- in fact, this is probably an all-around better system. But here's the catch: the x2 starts at $850 with the keyboard, compared to $750 for the W510 and dock. So, it's a great option for people who want pen support (or who have a lax budget), but we're otherwise not too keen on spending the extra hundred bucks; the x2 is better in some ways, but it's still a flawed product. Other models cost more and don't actually perform much better, if at all. We also don't have great things to say about the Samsung ATIV Smart PC, which you can buy with WiFi only or with an AT&T LTE radio inside. First of all, avoid the AT&T version. Stay far, far, far away. The price is $700 with a two-year contract, and that doesn't even include the keyboard. Not that the keyboard is such a great addition, though: the keys are cramped, and the tablet doesn't sit snugly enough inside the cradle. Plus, this is one of the rare keyboard docks that doesn't have a built-in battery, which means you've got just the main tablet battery to rely on. If you do decide to give it a shot, go with the WiFi-only version: not only is it contract-free, but it also has pen support, which the LTE version doesn't. Finally, Lenovo has a pair of Atom-powered hybrids: the IdeaTab Lynx, for consumers, and the ThinkPad Tablet 2 for business users. A little quid pro quo: we haven't reviewed either yet, so we can't vouch for things like performance, stability or battery life. Here are some basic specs, though, so you have a general idea of what you'd be getting. Starting with the higher-end of the two, the ThinkPad Tablet, it starts at $679 with a 1.8GHz processor, 2GB of RAM and 64GB of internal storage. The keyboard (which looks fairly comfy) is sold as an accessory for $120. While that might seem a bit pricey for a mere Atom tablet, this one at least has pen support, and comes with a pressure-sensitive pen. (It also has NFC, not you can do much with it.) If you can do without the NFC and pen input, the Lynx starts at a lower price of $649. Having met with Acer's product team in person (and having read its executives quoted in the press), it's obvious the company is eager to shed its reputation for cheap products and be taken more seriously as an OEM capable of building premium PCs. You can even see glimmers of that in the Iconia W510, with its lovely IPS display and optional accessories. Ultimately, though, the W510 does a disservice to Acer: with a chintzy build and a cramped, netbook-like keyboard, it confirms whatever pre-conceived notions shoppers may have about the brand. And with so many Windows 8 hybrids either out there or on the way, Acer can't afford to have its products get lost in the mix. If there's one thing that saves the W510, though, it's this: it delivers best-in-class battery life, and at $550, it's attractively priced for a device running full Windows 8. We're still not wild about it, but if you are going to get a low-powered Windows 8 hybrid, we'd sooner steer you toward this than some others on the market. No, it's not even close to perfect, but some of those other models cost more and don't actually perform much better, if at all. We also have yet to find a keyboard dock we're happy with (hopefully one of Lenovo's two hybrids proves better in this regard). For now, the W510 is okay for shoppers sticking to a budget, but if you've got more money to spend it might be a good idea to hold off for something that offers the full package.